Some time ago, we stumbled on katilemur's profile and were intrigued by a request which read “draw, please, the Dachshund – is a short-legged, long-bodied dog. It’s easy for drawing, really!”. 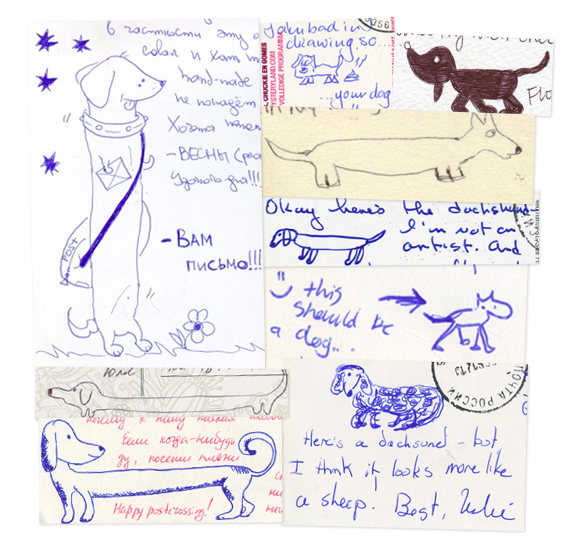 We wondered… did she receive a lot of drawn dachshunds on her postcards? Turns out… yes, she did! From the top-left corner (with permission), drawings by zheka-french, Anja71, flooranna, Lord5005, cami21901, katkarapusalaatti, Bookorama, Ella_Grape and julykachanova. We were curious so we asked Ekaterina… why dachshunds? “Once I wanted to get something more interesting than just ”greetings from… happy postcrossing". I thought how to encourage people to do little more than they used to. And I’ve decide the simple drawing is what I need. So remained only to choose a theme. It had to be something simple, have the typical features and everyone should know it and the result must be funny… I guess it’s very easy to draw the dachshund for anyone, even if you don’t know how to draw: long body with short legs! I’ve got the dachshund and I like this breed. So my choice was predetermined =)"
Great work, everyone! :) You can see more lovely dachshunds on katilemur's collection here. Love it!It makes the cards interesting to have the extra personalisation with the drawing! that is just so awesome! This is adorable. I hope to get to send her a postcard. How cool is that?! I love how creative people are, even if its not a complex drawing, the whole is greater than the sum of its parts! I also love how people have drawn it in pencil first before using pen...it means they've really made an effort. I have received PC's with handrawn dachshunds...they are my FAVORITE. I have two fur-babies that are of course dachshunds - we rescued them from backyard breeders. We love them !! What a cool idea! I love the huge loving community we have on Postcrossing! Gives you hope that the whole world really can have peace if we all try a bit. I recently got the address of someone who requested drawings of cats, so I sent a postcard of a drawing I did of my cat sleeping next to me as I wrote out her card. She was delighted! I love requests like that. So much more fun and personal than the typical tourist card. What a charming idea! Thanks for featuring this story. O-ho-ho, I remembered you wrote about this Dachshund's request in LJ comments some time ago! Drawing is a talent I wish I had. 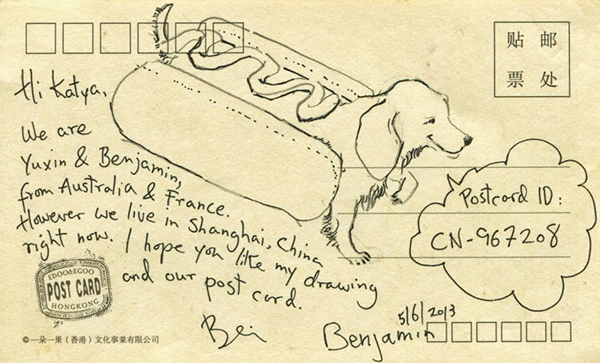 User BenjaminYuxin's drawing is great! I especially like the hot dog dachshund! nice i also have daschund dog name MOCCA, hes always be my naughty baby with those pity eyes. i also collect daschund dog postcard.cuddle cuddle..nice idea then! I too love daschunds and used to have one as a pet when i was a child. This is one collection i must see someday. Wonderful pictures. Dachshunds are so beautiful and cute dogs. And a great idea. I love Dachshunds. And I´m impressed how great the drawers did their job. It´s so cute and so creative. Thanks for sharing this with us.